Supercharged echinacea. 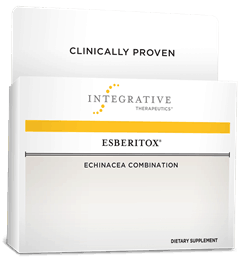 Chewable combination of 2 types of echinacea plus other immune-boosting herbs that is safe for the entire family. Over 30 studies support its use. Esberitox® has been the top-selling remedy in Europe for over 70 years, and is clinically tested. It doesn’t interfere with commonly prescribed medications, and can be used by your entire family.